It is June of 1939. Albert Bard (civic activist), George McAneny (president of the Regional Plan Association), Stanley Isaacs (Manhattan Borough President) and C.C. Burlingham (nicknamed “New York’s First Citizen” because of his lifetime of civic involvements) are deep in the trenches fending off a Robert Moses blitzkrieg. The all-powerful Moses is ramrodding through the permit approvals needed for his Brooklyn-Battery Bridge. Convinced that the bridge and its various access ramps would wreak havoc on the historic built fabric and iconic scenic view of historic lower Manhattan, this civic foursome is leading the resistance. 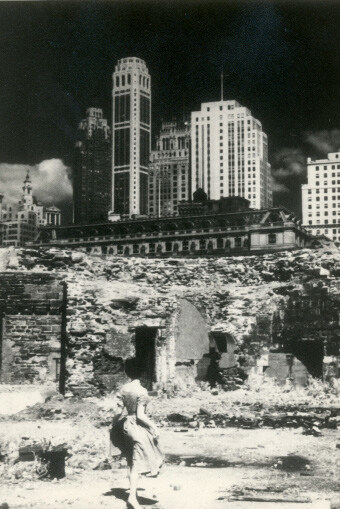 In a June 1, 1939 letter to Felix Frankfurter, Bard’s friend and newly minted Supreme Court Justice, Bard expresses the feelings that many preservationists have felt over the decades as they engaged in seemingly uphill battles to save some treasured piece of New York City. Does it sound familiar? Fortunately for New York City, Bard and his compatriots enlisted in their cause the one person in the country arguably more powerful than Robert Moses, President Franklin D. Roosevelt. FDR’s War Department denied the essential final permit needed for the construction of the bridge after considering matters of defense in times of war. In this case, as in many others, the “feeble little folk” did save a part of their city. Their reward would be spending the next decade battling Moses’ revenge: his efforts to unnecessarily destroy Castle Clinton. And again, the “little folk” claimed victory. Despite the odds, we can triumph. What specific historic preservation quotes are most inspiring to you? Contact us and let us know!